How to unlock Motorola Motorola Moto E by code ? Unlocking Motorola Motorola Moto E by code is the easiest and fastest way to make your device network free. It doesn't interfere in your system or change it in any way so even after using our code, you don't loose your warranty. In order to receive a network unlock code for your Motorola Motorola Moto E you need to provide IMEI number (15 digits unique number). It can be found by dialing *#06# as a phone number, as well as by checking in the phone settings of your device. Motorola network unlock service is universal. 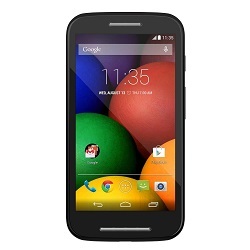 Codes for Motorola Motorola Moto E are provided in a short time and for a low price. The only thing needed to unlock this type of device is its IMEI number. It doesn't matter if the device comes from Europe, USA or any other part of the world. All networks are supported as well, so if you are a fan of AT&T, T-Mobile or any other, this service will be perfect for you. The year of production also is not important. For unlock Motorola Motorola Moto E following options are available. If you don't know which option use for unlock your phone, please contact us. We will help you choose the right product for your phone. Great service, easy to use, easy to track the status and the code worked without any issues. Unlocking instruction for Motorola Motorola Moto E ? The unlocking procedure is very basic, just follow these steps and your device will be network free. **In special cases you might try a #073887* sequence to force your device to ask for an unlock code. 4. Motorola Motorola Moto E is now capable for any network you want. Me funciono muy bien. Gracias. Perfecto, funcionó de maravilla. El mejor precio además. Pensaba que no funcionaría. Tardo unas 5 horas. Pero todo perfecto. Trochê d³u¿ej ni¿ ¶rednia ale ogólnie, wielki pozytyw i solenizant zadowolony z prezentu. EXCELENTE SERVICIO, LLEGO LA CLAVE EN MENOS DE DIUEZ MINUTOS Y FUNCIONÓ A LA PRIMERA. Estoy muy contento de haberlos elegidos, vuestro servicio a sido impecable.Felicitaciones a todo el equipo. Excelente servicio y lo mas importante, es seguro en minutos recibi el correo con el codigo muchas gracias.